The Chinese multinational company Alibaba specializing in technology has come a long way from being a popular e-commerce venture to building futuristic “FlyZoo” hotel. 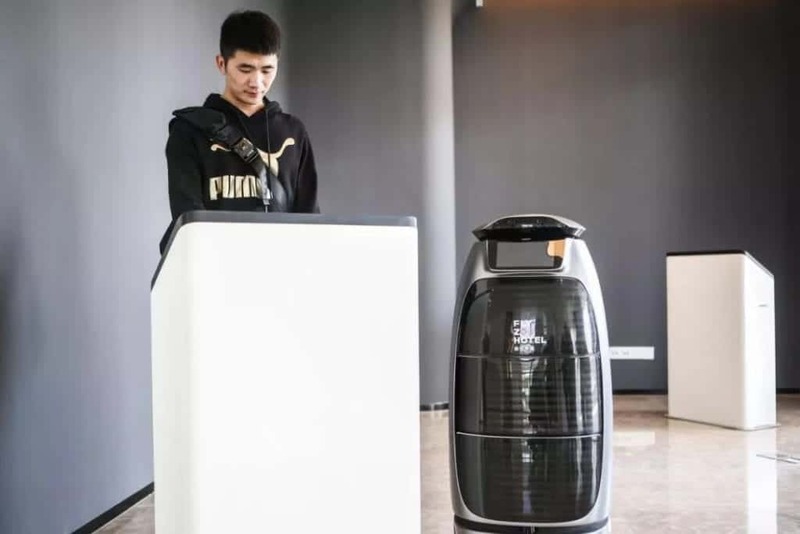 Even we ordinary people wouldn’t have imagined that – a meter-long robot delivering food and dropping off fresh towels in the hotel room for customers. Such robots are a major component of a suite of high-tech tools that cut the labor cost and eliminates compulsion of customers to interact with people, says Alibaba. The hotel was formally opened for public last month, consisting of 290 rooms. Alibaba aims to sell the architecture to hotel industry showcasing its mastery in the technology. Additionally, the hospitality experiment tests the guest comfort level with unmanned services. • A softly-lit white encrust walls remind the interiors of Hollywood spaceships, inside the hotel. • Face, Passport and other ID recognition system has been installed at the check-in the podium for guests. • Visitors possessing Chinese national ID can go through face scanning using their smartphones for early check-in. • Elevators too equipped with face recognition technology scans guests’ faces to verify which floor they can access. Also, hotel room doors are accessible with another face scan. • Alibaba’s voice command technology can be used to alter the temperature, operate the curtains, adjust the lighting and access room service in the suite. • Entering the hotel’s restaurant, you can see a tall capsule-shaped robot delivering and serving food ordered by guests using the FlyZoo app. • At the bar, a large robotic arm can prepare a variety of cocktails. • Facial recognition cameras add charges to the room rate automatically. • For check out process, guests need to press a button on the app which subsequently locks the room and they are automatically charged through Alibaba’s online wallet. • Post check out process, the facial scanned data of customers is automatically erased from the system instantly, reported by Wang. • The hotel also employs humans including chefs, cleaners, reception staff, and others. • The reception staff assists the guest in check in and check out process using AI technology. The Chinese conglomerate has released other highly automated projects for places like bookstores and grocery stores. The grocery stores called Hema have been successfully welcomed and well received by users leading to the store count of about a century across the nation. The aim of these projects presented by Alibaba is to develop AI and other high-tech expertise which will motivate e-commerce offerings of the company. It also intends to generate new sectors of business at a time when e-commerce revenue growth rates are tolling down, in part due to the US-China trade war. Wang also observed that the hotel still needs a bulk of improvisations as some of its services are inaccessible for many such as guests with a Chinese national ID recognition. Flyzoo derives its name from a Chinese pun symbolizing “it’s a must to stay here”. The hotel is situated in Hangzhou city which is 170 KM southwest of Shanghai. The location is at walking distance from the headquarters of Alibaba. The starting price for a room in FlyZoo in from 1,390 yuan (approximately $205) per night.